When I was in grade school, one of my dad’s coworkers at Nalco Chemical Company gave me a small aquarium and a starter supply of adult guppies. 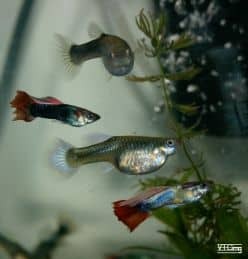 I soon learned a sure sign that a female is close to giving birth is the darkening of the gravid spot, the area that holds the guppy eggs. Because the babies actually are born live, I would remove a pregnant female and place her in a clear, plastic container having a slotted, v-shaped piece in the middle. Upon birth, the fry dropped through the narrow slot, protected from their hungry mother. One time a baby was very lethargic following birth, laying still at the container bottom. I reasoned its only chance of survival was to swim for its life with the adult fish. It rose to the occasion, choosing risk over (dis)comfort. Like baby guppies thrust into a frenetic aquarium world, hiding in plants and sneaking out for food when the coast is clear, we feel small and insignificant following our vocation loss. Fear surrounds us. That fear, John Ortberg observes, makes us “live as though we serve a limited, finite, partially present, semi-competent God.” Yet, while former colleagues and church family may be indifferent to our anguish, Jesus is not. As we run into His arms, our darkness is turned to dawn. We become alive to Christ! Acts 1:3 – After his suffering, he presented himself to them and gave many convincing proofs that he was alive.